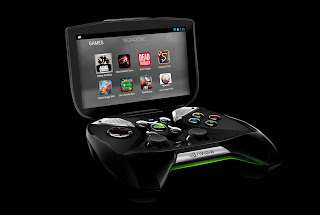 After just announcing their next generation Cortex-A15 quad Core Tegra 4 processor, Nvidia also showed off its "Project Shield" handheld console. It's powered by the very Tegra 4 they had just announced and would sport specs like a 5inch 720p display, a 3400mah battery and standard micro-HDMI, micro-USB, MicroSD card slot and 3.5 mm headphone jack. The device itself would be running an unaltered version of vanilla Android 4.1 Jelly Bean. It, in addition to running android games, would be able to play games, like Steam on Big Picture, run on a user's Nvidia Kepler equipped host PCs. According to Nvidia, it will be available to Canadians in Q2 2013.